Capt. 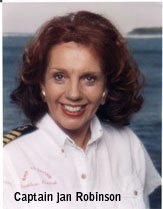 Jan Robinson a native of New Zealand, was Captain and Chef aboard her 60-foot yacht VANITY. 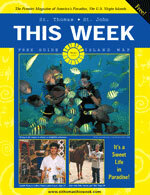 For more than 20 years Jan cruised the Caribbean islands and entertained many charter yacht guests. Her growing reputation as a sea-going chef, and incessant entreaties for her recipes from her charter guests, prompted Jan to collect recipes from other yacht chefs and write her first cookbook Ship to Shore I, now in it's 17th printing. The overwhelming success of Ship to Shore I, led inevitably to Ship to Shore II, then Sip to Shore, a collection of cocktails and hors d'oeuvres, followed by Sea to Shore, a treasury of scrumptious fish and shellfish recipes, Sweet to Shore, "Life is uncertain, have dessert first"- decadent desserts, cakes and candies, Slim to Shore, recipes for a healthier lifestyle, Bahama Mama's Cooking, recipes from the Bahamas There is also Store to Shore, featuring 400 recipes with complete menus and detailed shopping lists, and Famous Virgin Islands Recipes. When not sailing, Robinson divides her time between her homes in the Virgin Islands and North Carolina, where she is active in local culinary circles and does much of the research, recipe testing, and writing for her cookbooks. Jan is an active member of The American Institute of Wine and Food. She holds certificates from the Cordon Bleu Cooking School, The Ritz Cooking School, and the Culinary Institute of America. She makes personal appearances at major boat shows throughout the United States. Coordinates culinary contests and has made numerous cooking and autograph tours promoting her cookbooks around the country, the Caribbean, and New Zealand. Jan's adventurous life and culinary expertise have been featured in numerous national and international publications; she is a much sought - after speaker, host, judge and coordinator of culinary competitions. 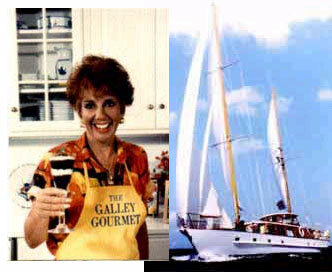 Robinson's television cooking credits include "The Morning Show" with Regis Philbin, and the NBC Special "The Cruise of the Vanity" which featured Jan and her yacht. As "The Gallery Gourmet" Robinson authors a monthly column for All At Sea, Yacht Essentials, occasionally Yachting Matters and other international publications. Interested in chartering your own private yacht for a vacation of a lifetime? Call or email Jan at 704-277-6521 or [email protected]. When the guests on Jan Robinson's chartered yacht cruises suggested that she offer a spa cruise with healthier choices, Robinson, a member of the Rotary Club of St. Thomas, Virgin Islands, took courses in nutritional cooking and eliminated rich sauces from her gourmet menu. And in the process she noticed an improvement in her own health. "By doing something healthy for my guests, I took off 25 pounds and I've kept it off," she says. The author of Slim to Shore and several other yachting cookbooks, Robinson, 60, now prefers foods seasoned with lemon or lime juice and pepper to those flavored with heavy cream and butter. "This is preventive medicine," she says. "Some people look after their cars better than themselves." Robinson's diet focuses on plant-based foods, in line with recommendations from such major health organizations as the American Heart Association and American Cancer Society. Increasing fruit and vegetable intake helps to decrease total calories and saturated fat, which can help reduce risk for heart disease and certain cancers. Plant-based foods contain disease-preventing phyto-chemicals; lycopene in tomatoes, for example, has been linked with reductions in prostate cancer. "It's a smart way to go," says Erica Frank, M.D., M.P.H., vice chair of family and preventive medicine at Emory University School of Medicine in Atlanta. In the last 25 years, data from more than 120,000 women who participated in the Nurses' Health Study (launched in 1976 at Brigham and Women's Hospital and Harvard Medical School and now among the largest ongoing investigations of risk factors for major chronic diseases in women) have shown that consuming more fruits, vegetables, whole grains, and fewer refined carbohydrates (sugars, sweetened cereals, soft drinks) can substantially reduce the risk of heart disease. Findings published in 2001 showed that for each serving of a fruit or vegetable added to the diet per day, the risk of heart disease decreases by 4 percent. The Health Professionals Follow-Up Study, conducted with more than 51,000 men, has shown that a diet high in whole grains, vegetables, fish, and fruit reduces the risk of noninsulin-dependent diabetes, blindness, kidney failure, and heart disease. Whether entertaining on land or at sea, you need only decided which contributing chef's menu planner most appeals to you or your guests then refer to the detailed shopping list provided. The chefs show you how easy it can be to prepare "carte du jour" recipes for every meal that day. Cooking and entertaining for every occasion, informal to elegant. Helpful hints and tips on preparation, planning, cooking and technique. Capt. 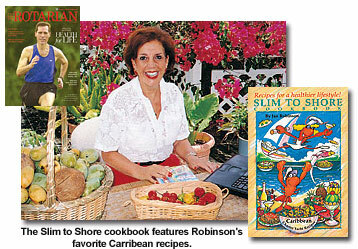 Jan Robinson's Store to Shore is the eighth volume in her popular Ship to Shore Cookbook Series. A charter yacht captain herself, Robinson's prodigious publishing credits include Ship to Shore I, Ship to Shore II, Sip to Shore, Sea to Shore, Slim to Shore, Bahama Mama's Cooking and Caribbean Adventures (Cajun cooking). Special features include: 48 spectacular full-day menus, shopping list for each menu, more than 400 delicious, mouthwatering recipes, cooking and entertaining for every occasion, informal to elegant, helping hints and tips on planning, cooking and technique, "Where to shop" suggestions, preparation and planning, participating yachts, a personal invitation. New Zealander Captain Jan Robinson has over the past three decades supplied her ever-increasing list of loyal followers with a series of eight user-friendly, internationally acknowledged Ship to Shore cookbooks. Jan holds certificates from the Cordon Bleu Cooking School, the Ritz Cooking School, and the Culinary Institute of America. Besides being a prolific cookbook writer, Jan is a sought-after speaker, host and judge of international cooking competitions. She has been profiled in numerous publications. Since 1983, "Captain Jan" has been a revered household name in this part of the continent. That's the year the effervescent New Zealand native and charter Yacht captain Jan Robinson published her very first cookbook title, "Ship to Shore." Pardon the unabashed pun but locals and vacationers ATE IT UP - and wanted more. The focus of the publication was meant to assist charter yacht chefs with the demanding task of creating luscious meals from a galley not much larger than a play school kitchen. It was a sharing of the minds and the recipes from some of the best seafaring hosts in the business. However, the end result was that homeowners, villa renters - virtually everyone who was a better eater than cook - quickly embraced the delights of creating simple, elegant meals. Enthusiastic readers were thrilled to learn the tricks of the trade when it came to preparing, cooking and savoring meals served aboard the finest yachts in the Caribbean. What a boon for entertaining on land as well as sea! How in the world did it all begin? According to Jan, she and her husband Pero were living in North Carolina until 1979. He was a civil engineer and attorney; Jan was making her living in real estate. They both decided it was time to retire and they purchased a 60-foot steel hulled motor vessel to enjoy in the tropics. "Back then, it was one of the largest yachts in the Caribbean," said Jan with a bright smile. "I soon learned that my husband's idea of retiring was cruising the middle of the ocean and working on the boat. Mine was heading for the marina and putting up the cocktail flag. The perfect compromise was that we become a charter boat." Captain Jan also discovered that chartering meant preparing meals four times a day for seven guests, seven days a week. "I was working 12 hours a day," said Jan. "We decided that we'd only charter for three years. But guests were re-booking with us as soon as they got off the boat. We had a 60-per-cent return guest rate." Little wonder. Jan was born a magnificent hostess. She is also an accredited member of the American Institute of Wine and Food with certificates from the Cordon Bleu Cooking School and the Culinary Institute of America. "I love to give parties," said Jan, adding that every meal she served aboard had a fresh place setting and a new look. As Jan put it, "People eat first with their eyes, then with their nose and finally with their tastebuds." The Robinson's ended up chartering for ten years. During that time, Jan's efforts to swap recipes and serving tips with fellow charterers evolved into culinary creativity at it's finest. "Ship to Shore" was born containing 680 Tastes of the Caribbean from 65 chefs and Captain Jan Robinson sailed previously unchartered career seas as The Gallery Gourmet. Multiple publications followed as well as a video cookbook, "Tropical Temptations." Over the years, each of the eight publications from The Galley Gourmet has enjoyed a personality all its own. "Slim to Shore" brought us gourmet tastes without the guilt. "Sweet to Shore" was a divine offering to the dessert gods. "Sip to Shore" was a fun-filled exploration of beverages and hors d'oeuvres. Captain Jan has recently completed the quintessential cookbook emcompassing every aspect of charter yacht hosting. "Store to Shore" goes the extra mile - or knot, as the case may be - offering comprehensive full-day menus from 50 international yacht chefs as well as proven recipes and shopping lists. Over 400 mouth-watering recipes are spotlighted along with hints on planning, preparing and hosting. As always "Store to Shore" is equally appropriate for landlubbers' events.